Baked Fruit - Delicious fresh fruit baked with coconut oil. GLUTEN FREE, GRAIN FREE, DAIRY FREE, REFINED SUGAR FREE, SPECIFIC CARBOHYDRATE DIET (SCD), PALEO. I’m always looking for new breakfast ideas. New research shows that not only is healthy food necessary for a healthy gut but a variety of healthy food is essential. With that in mind, I aim to eat as much variety as I can day-to-day. Apart from keeping my gut healthy, it means I don’t get bored of having the same foods all of the time. 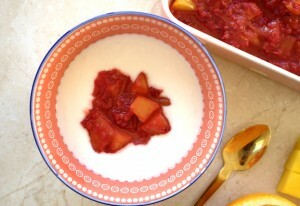 I loved stewed apple so I have been thinking about experimenting with baked fruit for some time. This tastes absolutely delicious for breakfast or any time of the day for that matter! Breakfast can be difficult aspect of SCD. You wonder what you will eat if you remove gluten and grains. I can honestly say that my breakfasts now are far more tasty and adventurous than there were before. Most days I have something different and weekend breakfasts are a big affair. We usually go all out and have a few courses! SCD rarelly feels like a “diet” for me and much more of a lifestyle change. I am so passionate about good ingredients and I love feeding my family nutritious food. Baked fruit is a great way to use up some fruit if you have an abundance of it, like we often do! Don’t be afraid to experiment with different fruits. It would also work great with blueberries and pineapple, I imagine. I don’t add any honey because as honey is still sugar, albeit unrefined, I try to keep my daily intake low. If you feel this is too tart for you, you can easily add a drizzle of honey after. 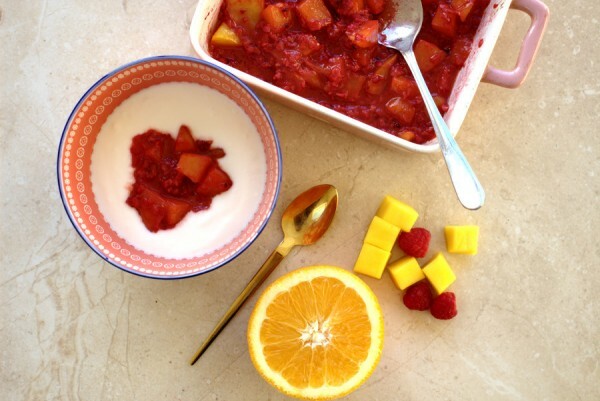 Baked fruit goes great with SCD yoghurt, my easy and quick pancakes or my grain-free granola. 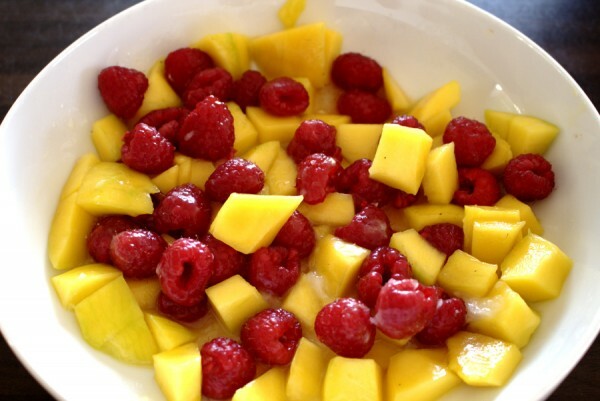 Place the mango and raspberries in an ovenproof dish. Mix together the coconut oil and the orange juice and mix well over the fruit. Bake for 20 minutes until the fruit is soft and releases all its juices. Enjoy with yoghurt or granola.